How excited am I about our new casserole dish? When I think of a beautiful, heavy cast iron pot, I think of slow cooking and developing deep, rich layered flavours. 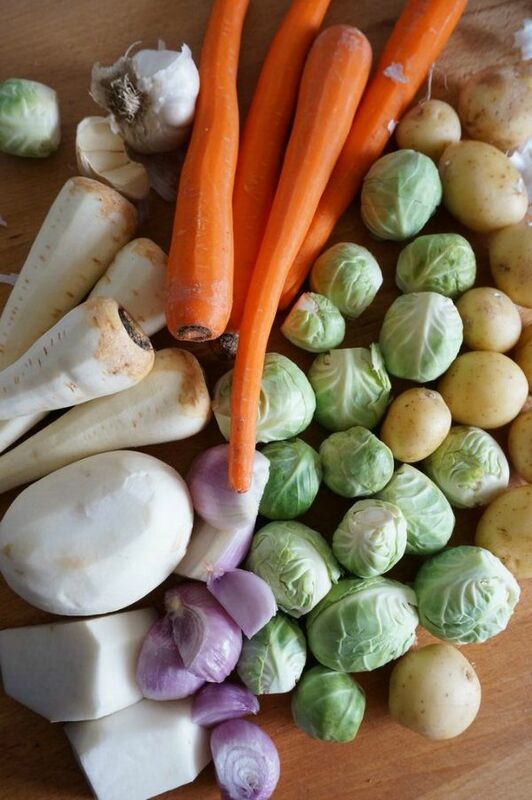 During our most recent trip to the farmers’ market we filled our baskets with the flavours of fall – potatoes, brussel sprouts, turnips and parsnips. I knew with this high performance pot, we could make a big batch or flavourful fall beef stew. 1. Heat olive oil in pot, over medium high heat. The oil must be hot enough to sear the beef. 2. Use a paper towel to dry the cubes of beef. Toss beef in flour, seasoned with salt and pepper. 3. Once oil is hot, place beef in pot and brown in a single layer. This step will take some time, but it is important to sear all sides of the beef. 4. When beef is browned on each side, remove from pot and place in heat proof dish. Place next batch of raw beef in pot. Should require 3 batches of browning. 5. Lower heat to medium and add onion and garlic. Saute until onion starts to soften. 6. Add hardest vegetables to the pot first – carrots and parsnips. If the pot is becoming too dry, add a splash of beef stock. 7. Let cook for 5-10 minutes, until carrots and parsnips begin to soften. 8. 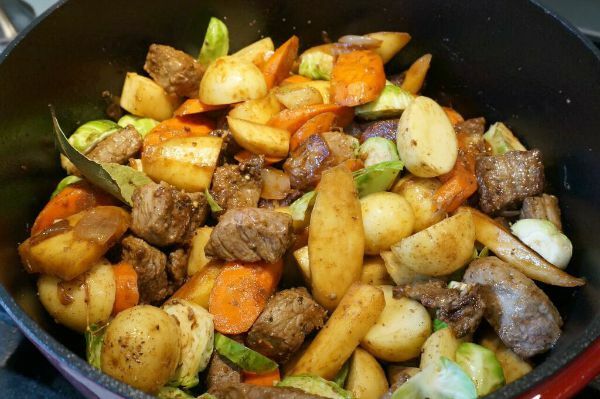 Add the remaining vegetables – potatoes, brussel sprouts, turnips and return beef to the pot. 9. Bundle thyme with kitchen string and add to the pot, along with bay leaf. 10. Pour all but 1/2 cup of stock in. Bring to a boil and then drop to a simmer. Place cover on, leaving a gap for steam to escape and simmer for 1 to 1-1/2 hours, until all vegetables are tender. 11. Once vegetables are tender, remove thyme and remove the lid. 12. Create a slurry by dissolving corn starch in the remaining stock. Pour into the stew. The slurry will help to thicken the stewing liquid. 13. Let stew simmer, uncovered, for an additional 10 minutes. 14. Serve stew with chunky bread…perfect for dipping. So, what would you make in a dutch oven? 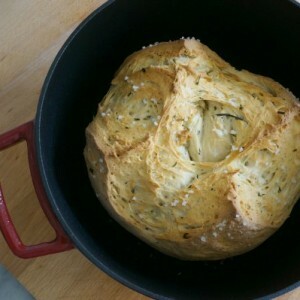 I’ve also made an awesome dutch oven herb bread…seriously, bread in a pot! Heat olive oil in pot, over medium high heat. The oil must be hot enough to sear the beef. Use a paper towel to dry the cubes of beef. Toss beef in flour, seasoned with salt and pepper. Once oil is hot, place beef in pot and brown in a single layer. This step will take some time, but it is important to sear all sides of the beef. When beef is browned on each side, remove from pot and place in heat proof dish. Place next batch of raw beef in pot. Should require 3 batches of browning. Lower heat to medium and add onion and garlic. Saute until onion starts to soften. Add hardest vegetables to the pot first – carrots and parsnips. If the pot is becoming too dry, add a splash of beef stock. 7. Let cook for 5-10 minutes, until carrots and parsnips begin to soften. 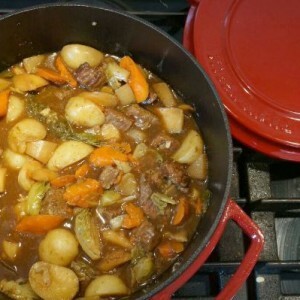 Add the remaining vegetables – potatoes, brussel sprouts, turnips and return beef to the pot. Bundle thyme with kitchen string and add to the pot, along with bay leaf. Pour all but 1/2 cup of stock in. Bring to a boil and then drop to a simmer. Place cover on, leaving a gap for steam to escape and simmer for 1 to 1-1/2 hours, until all vegetables are tender. Once vegetables are tender, remove thyme and remove the lid. Create a slurry by dissolving corn starch in the remaining stock. Pour into the stew. The slurry will help to thicken the stewing liquid. Let stew simmer, uncovered, for an additional 10 minutes. Serve stew with chunky bread…perfect for dipping. Looking for more fun family food inspiration? 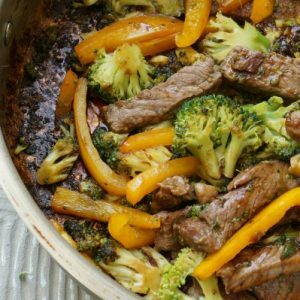 Check out our Family Food & Recipes board on Pinterest. I would make a yummie pot of chili for my family! TY! 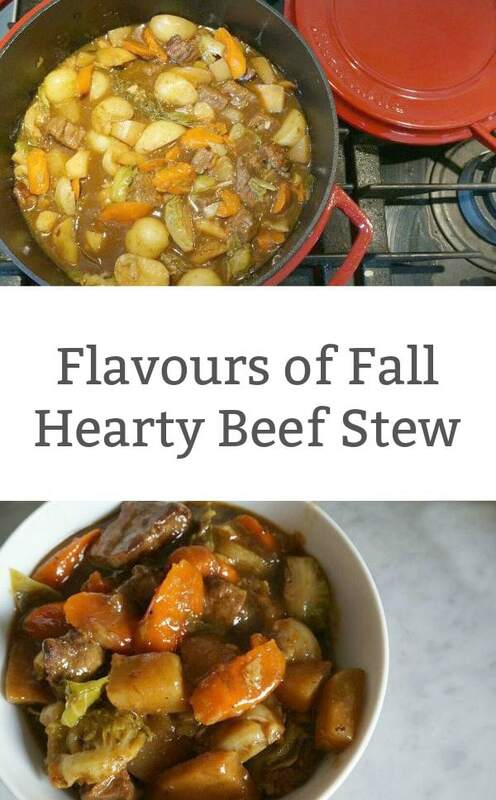 I would make a pot of hamburger stew, one of our fall/winter favourites! What an amazing pot, so many possibilities! I would first use the lid to sear my roast beef on all sides, top and bottom, then grill my veggies, just enough to flavor. Then it’s time to toss all in the pot with a bit of red wine and beef stock, pop in the oven and let it slow roast until done to perfection. With the even heating this pot offers perfection is the only way to describe! I’d make my delicious shepherds pie! What a lovely casserole dish. I would love to make Sweet and Sour Chicken in this and a Hasty Pudding also. I’m not sure what Hasty Pudding is, but it sounds good. cabagge roll casserole is what i would make in this. Oh, now that sounds delicious. 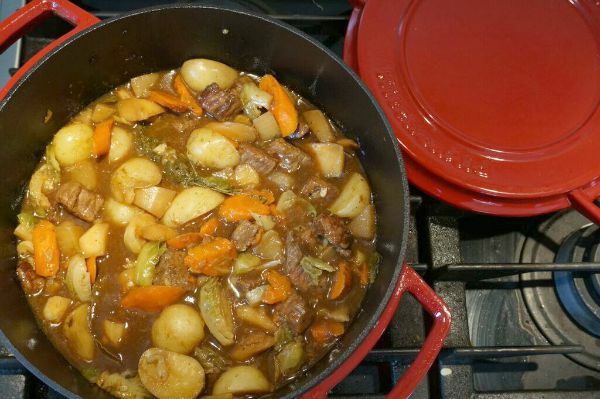 After reading your review, looks at the pictures as I wipe the drool, I would have to try the Beff Stew also! But I would also be making Chili and my stuffed peppers in there too! Yep, chilli is another favourite around here. this is an easy one Id love to make my famous chili in it. The winner is randomly selected. I’d make a nice fall soup. Probably stuffed pepper soup! Yep, I could see a delicious soup being made too. I would love to make turkey neck soup in this pot. I would like to make Chicken Stew and Dumplings. Thanks for sponsoring this awesome giveaway and for the opportunity to participate. I would make homemade vegetable soup. I would make pumpkin curry. I’d love to make a big pot of chili! I recently(Tuesday) made a herb and crimini mushroom crusted prime rib roast, this would of come in so handy! I would make braised lamb shanks! I would make my from scratch shepherds pie. It’s my favourite fall dish! 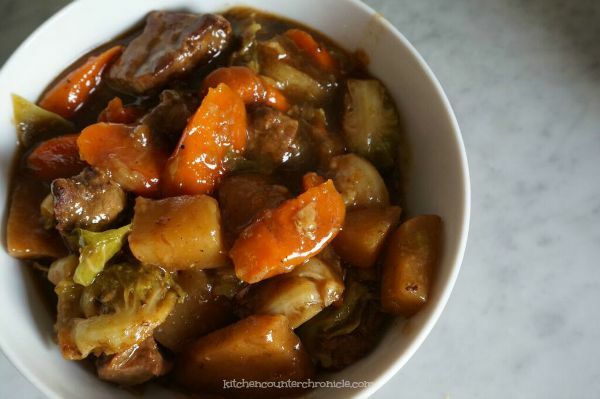 I would make cabbage stew! I would like to make sweet and sour ribs. I’d love to make Borscht, stew, and chili.